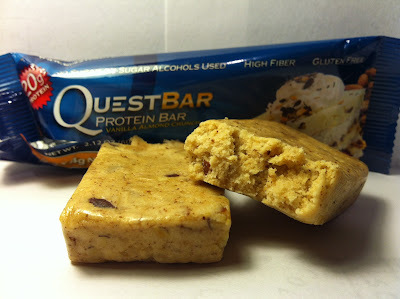 Quest bars are only available through the internet and since I'm a pretty cheap guy, I refuse to pay the prices (plus shipping) for a bar through the internet, so I don't have them often. So, whenever I see a free giveaway on these, I'm all over it. Much like my last Quest review, I got this Vanilla Almond Crunch bar through a free giveaway on their website. 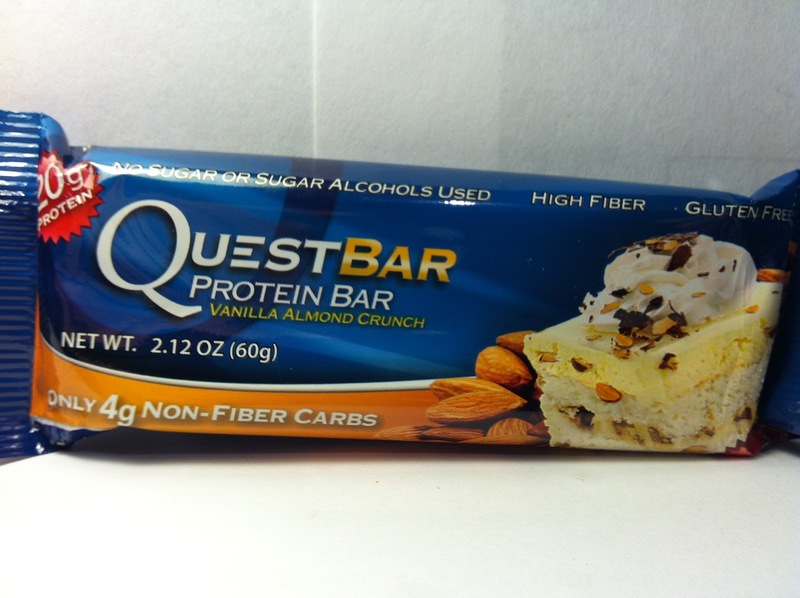 The bar itself is 2.12 ounces and has 200 calories with twenty grams of protein. The fact that this can pack so much protein in a relatively lowish calorie treat is astounding to me, but I guess science amazes me every day. Anyway, this is also billed as a low carbohydrate and low fiber bar, so there's all sorts of good stuff going on. As you can see from my picture above, this bar takes the vanilla theme and runs with it as the bar is colored in the off-white tone of a typical vanilla product. It's then mixed with some pretty decent sized almond pieces along the way (you can see them in the picture), although those almond pieces aren't particularly well spread. There are some here and there, but you can tell visually that unless you take a big bite, you won't get much of an almond presence. You do get a very strong presence by way of smell though as this bar has a particularly potent mix of vanilla and almond scents. Another thing to note is that this bar was particularly soft and broke apart very easily, yet held itself together in the process, much like a soft baked cookie. One other note is that it was particularly sticky to touch. I know that doesn't rally matter, but that's just one of the characteristics of the bar. Anyway, as I bit into this bar, I was expecting it to be particularly soft and doughy like the aforementioned cookie comparison that I made, but it wasn't. It wasn't a hard bar by any means, but it was kind of gummy in the fact that you had to give your mouth a workout to chew it. Having had enough of these bars, I can easily chalk that chewiness up to the protein blend as I've noticed that those blends tend to have that effect bars. In terms of the taste, the strong smell of almond and vanilla carried over into this bar as it was exceptionally strong tasting with both of those tastes. I like both of those flavors, so I was fine with it, but I could see those flavors being overpowering for someone that's not as big of a fan of them as I am. As for the sparse almond pieces, they did provide an occasional crunch to the chewiness of the bar, but that was so few and far between that I barely noticed it. Buy It or Fly By It? Even with the overpowering flavors, I give this a BUY IT rating because those are two flavors that I have a fondness for. If you don't like those flavors or don't particularly care either way, you are probably not going to like this bar because those flavor profiles are so strong. Given the opportunity though, you may to give it a try because perhaps you might enjoy it, but that's all up to you. These are the best! Cinnamon Roll is my favorite. It is really unfortunate that they are so pricey. However, mister Crazy Dude, you can find these bars at various Vitamin Shoppe locations in addition to the internet. Anyway, thanks for another great review. I was not aware of that (obviously), so thanks for the tip! It's nice to know that these actually are available in a brick and mortar store. Oh these look pretty good; ivehad some bad experiences with protein bars of them tasting really yacky! I realize this is an old post, but I believe these are actually high fiber. I just got a few free samples too and they are the best protein bar I've tasted so far! Agree with the first commenter about the Cinnamon Roll! another suggestion: Oatmega 3 bars/cookies.